The path will run to the left of this fence and underneath the overpass in the distance. More exciting infrastructure news: The last piece of Albany’s station project is about to fall into place. 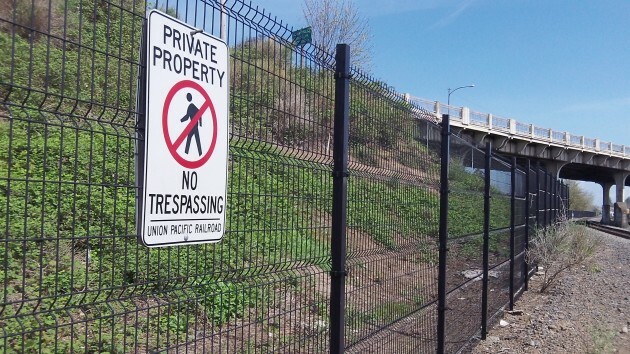 The Oregon Department of Transportation has awarded a contract for construction of a 600-foot path from the rail-and-transit hub to the other side of the Pacific Boulevard viaduct and the vicinity of Swanson Park. Rick Little of ODOT reports there were 14 bidders, and the contract went to HP Civil Inc., the low bidder at $383,692. The company is based in Dallas, Texas, and has an office in Salem. The view from Albany Station in the direction the new path will take. The project calls for a concrete “multiuse” path from the northeast end of the station along the rail line under the overpass to the north side of Highway 99E. It will run at the base of the embankment that carries the highway across the Union Pacific mainline. This will require three retaining walls, and the design also calls for handrails and lighting. Little says construction will start in May and be completed by September. The funding comes mainly from federal grants administered by ODOT. The path is the last part of the big Albany Station project, planning for which started some 20 years ago. 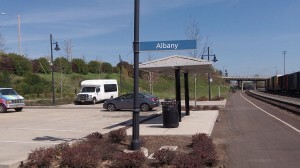 The other main parts of the multimillion-dollar effort were restoration of the historic train depot and, more recently, the renovation of the former Railway Express shed as the headquarters of the Albany Transit System.